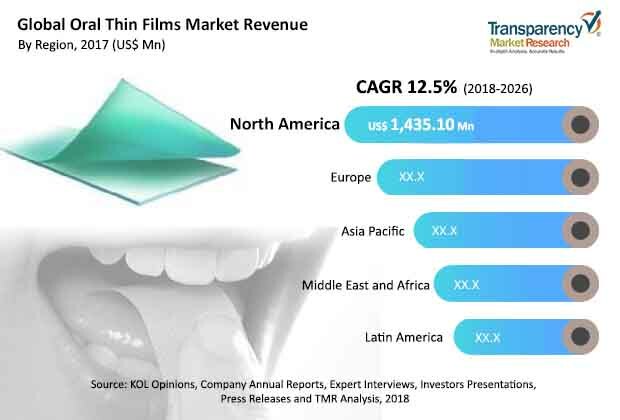 The global oral thin films market is prophesied in a report by Transparency Market Research (TMR) to find players focusing on the development of new products with a view to attain a position of strength in terms of revenue share. Strategic collaborations could be one powerful way of bringing new products to the market. There could be an increase in the level of competition observed in the market. Key players such as Aquestive Therapeutics, Inc., Indivior plc, and ZIM Laboratories Limited are looking to expand their operations across several profit-making regions of the market. TMR expects the global oral thin films market to register a CAGR of 13.0% between 2018 and 2026. The market was worth a US$2.1 bn in 2017. Among disease indications, schizophrenia could take a lion’s share of the market during the course of the forecast period. On the geographical front, North America is foretold to show its dominance in the market while rising at a 13.0% CAGR. The production of oral thin films is being upgraded to the next level with significant advancement in technology. Manufacturers are using polymeric film to offer enhanced taste masking and systematic absorption. Growing reputation of oral thin films as a novel, an emerging, and effective drug delivery system is predicted to push the growth of the market. The use of oral thin films for preventing gastrointestinal degradation of acid sensitive drugs could bode well for the market. Oral thin films can keep drugs unbroken after consumption until they dissolve. The development of oral thin films in pharmaceutical dosage form proves their novelty in terms of drug delivery. Developed regions such as North America could witness high adoption of oral thin films in the coming years. Expensive cost of treatments involving oral thin films is projected to loom over the market as a threat that could discourage the rise in demand. Other factors such as the requirement of vast research investment and challenges related to drug development could hamper the demand in the global oral thin films market. However, the market is prognosticated to exhibit stable growth despite uncertainties associated with penetration rate, approval, and development. Both startups and established names in the pharmaceutical industry have been showing great interest in oral thin films. Various advantages of oral thin films are envisaged to create a large consumer base for vendors functioning in the market. For instance, patients with swallowing difficulty are observed to prefer oral thin films. Compared to oral tablets, oral thin films have been proven quite advantageous as they improve medication safety, offer a better taste, and do not need water for consumption.